It has been a very busy last few weeks for the Association. As a result of damage done to the island of Puerto Rico by Hurricane Maria, we have relocated the 2018 Annual Meeting to the Arizona Biltmore in Phoenix, Arizona and were able to maintain the original meeting dates. I want to commend the leaderships of the AAHS, ASPN and ASRM as they worked collectively and efficiently over this past month to find a suitable alternative for the organizations’ meeting in January. Our thoughts are with those in Puerto Rico who continue with recovery efforts. The AAHS, as an organization, will be making a donation to Puerto Rico recovery, and if any members are interested in making personal donations, please consider one of the organizations at the following link. See list of IRS-verified nonprofits working on recovery in Puerto Rico after Hurricane Maria. 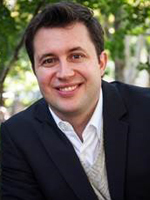 Dr. Warren Hammert and Kim McVeigh have planned a superb scientific program for January with excellent instructional courses, interesting speakers and engaging panels, including a panel focused on our theme for this year "Inclusion and Collaboration". This panel titled "AAHS and ASSH – The Past, Present and Future," will include Dr. Jim Chang. President of ASSH, and Past President Dr. David Green, as well as Dr. Bob Russell, AAHS Past President, and I will serve as moderator. This panel is going to explore the past, present, and future of the AAHS and ASSH, and should be quite interesting. The Association has quite a few collaborations in the pipeline, including combined webinars with AAOS, OTA and POSNA, international courses, as well as others to be shared as they begin to formulate, and I look forward to sharing more with the membership in the near future. I hope to see many of you in Arizona this January. The 2018 AAHS Annual Meeting has been relocated to the Arizona Biltmore in Phoenix, Arizona. The meeting dates have NOT changed and will remain January 10-13, 2018. If you have already made your reservations at the El Conquistador Hotel in Puerto Rico, the hotel will be automatically cancelling your room reservation and you will receive a full refund credited back to your original payment method. You are required to make housing reservations at the Arizona Biltmore Hotel directly. Visit the AAHS meeting website for all meeting details. I became interested in personal finance for doctors around the time when I started my first job as an attending surgeon. For many physicians, that first job is exciting. Some of us wonder what kind of house or car we will buy… until some realize that "more money = more problems." As a new surgeon, you no longer qualify for a low-income based repayment plan for your school loans, and that dream of a house or a car surely is checked by the realization that much of your new salary may be going toward your student debt! So what is the best way to handle that debt? This article will cover some of your repayment options. First, I’d like to start off with a case presentation of a 33 year-old male who is a recent graduate of a hand fellowship program with no past history of formal financial education. Social history reveals he funded medical school completely on student loans. He admits that he put his head down for 6 years in surgery training because he "wanted to focus on becoming the most talented surgeon – not the richest." He deferred his payments each year, as this was the advice given to him by a chief resident with an identical situation. "It is the easiest route for someone living in a high cost city." Unfortunately that advice and choice had consequences. This doctor presents for help noting that the principle balance of the 8.5% interest - federal loans had nearly doubled in the time it took to complete surgical training. Does this sound familiar? How often is this misinformation passed through generations? I would have been truly lost had it not been for discovering the book and podcasts entitled "White Coat Investor" by Jim Dahle. 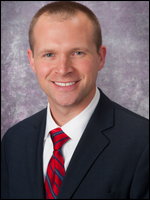 Dr. Dahle is an emergency physician who created a physician education web-log for thousands of people just like me. As member of the AAHS, I would like to break the cycle of financial ignorance for hand surgeons. Below I will summarize much of what I have learned on student loan refinancing. Additional reading can be found at a great resource, the White Coat Investor blog: https://www.whitecoatinvestor.com/student-loan-refinancing/. The first question to ask yourself when you graduate and want to make a plan is whether or not you qualify Public Service Loan Forgiveness (PSLF). In this program, you make 120 monthly payments on your student debt, and the remainder is forgiven tax-free (regardless of the starting balance). Generally, the idea is that you start making payments as a resident, which are lower if you choose an income based repayment plan, and then pay for a few years after training if you work for a non-profit health system (or 501c3 organization). PSLF is usually the best pathway for physicians who work in academics who started making payments while in residency. You can eliminate (essentially the government pays back) a large debt sum very efficiently if you start early. If you cannot qualify for PSLF, then refinancing the loans is probably your best bet. Standard government loans are generally 6-8.5%, which is very high! Several companies exist today that will offer you much lower terms. In general, variable interest rates run from about 2.5-5.5% and fixed interest rates run from 3-6%. Higher rates are for longer-term loans and for physicians with poor credit ratings. Loan terms exist for 5,7,10,15, or 20-year periods. Which loan period to choose? Dr. Dahle recommends clearing your high interest debt as quickly as possible as your first priority. If you can, a 5-year repayment loan would be best, but if not, then the shorter the term is better. In his words, "if you can live like a resident for 2-4 years after training, you can pay off your debt and save for your nest egg." His advice: do not splurge your new income on new material goods and try to keep your new expenses to a minimum. How about whether to choose a variable or fixed interest rate? It depends on how aggressively you want to pay back the loan. Conventional wisdom would argue that fixed rates are the safest for longer-term loans, and that is true. A variable rate means that the rate can increase (or decrease) depending the Federal Reserve. So the fixed rate (generally 1.5% higher than its variable counterpart) is essentially a built-in form of insurance that the finance companies calculate to adjust for possible rate increases. However, a variable rate may actually be a better choice if you are willing to sign a short-term deal. The reason is that the rate would have to increase both severely and quickly for it to cost you more in the end. If the rate increases slightly, then it may still be below the fixed rate. If the variable rate increases over the fixed rate toward the end of your term, then you still come out ahead because you have already paid the majority back at the lower rate. So in essence, it would have to rise severely and quickly for it to cost more. One thing to note is that once you refinance with a private company, you cannot go back into the government program. You cannot qualify for PSLF and you lose some of the government protections upon refinancing with a private company. Some people worry about repaying these loans in the event of death or disability. Many private companies actually will forgive the debt in the event of death or permanent disability, and you should certainly inquire about this feature when signing a contract. If the company does not forgive the loan in the event of accidental death, then supplemental death or disability insurance could be purchased to cover these costs, which will likely still be less than your overall cost in a high interest government loan. So how to get started? A list of reputable refinancing companies that work with doctors can be found at the White Coat Investor Blog: https://www.whitecoatinvestor.com/12-things-to-know-about-student-loan-refinancing/. They even will give you some cash back for clicking through this website. When you visit the website and enter some basic information, your possible rates are visible within minutes. You can sample 2 or 3 companies and go with the lowest rate. They will ask you for some paperwork, you will sign a contract, and then they will pay off your loan. A month later you will begin making payments to the refinance company and hopefully be on your way to a debt-free future! 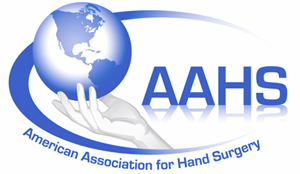 The AAHS is pleased to welcome the Italian Society for Surgery of the Hand to its 2018 Annual Meeting as guest society! Learn more about the Italian Society for Surgery of the Hand and its rich history and mission by visiting www.sicm.it. Hopefully, if you are reading the AAHS Newsletter, you know that the Annual Meeting has been relocated to Phoenix, Arizona due to damage from Hurricane Maria in Puerto Rico. The dates of the meeting remain the same, January 10-13, 2018. The theme for this year’s meeting is "Inclusion and Collaboration." As always, there will be an incredible variety of Instructional Course Lectures by leaders in the field. James Urbaniak will give an invited guest lecture title, "To Make a Thumb or Not Make a Thumb – That is the Question." 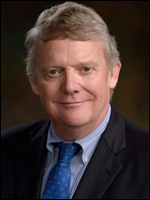 Current AAHS President Willam Pederson will give his Presidential Address, titled "Primum No Nocere – How do we Teach Judgment." The Annual Hand Surgery Endowment Golf Tournament will be held on Saturday January 13, 2018. I have been working with our amazing staff to work on modernizing the newsletter and trying to brainstorm new articles and features that would be interesting to our members. This issue we will debut an article on financial concerns for doctors. I think this article will be especially interesting and informative for our young members that are burdened by student loan debt. If you have any ideas or suggestions for a quarterly article or even a one time feature, please feel free to contact me. What value do Hand Therapists bring to the Value Based Payment system? And how do we objectify it. 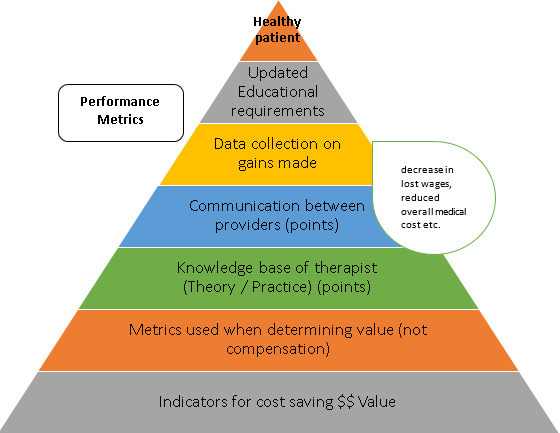 What performance metrics do hand therapist use to assess themselves or rather what metrics are used by others (surgeons/ patients) as a metric to rate therapists. The combination of experience, knowledge base, and clinical reasoning distinguishes Hand Therapists competencies and performance beyond the CHT certification. Given the range surgeons and referral sources have an extremely influential role for the best care for their patients. However, with the advent of big medicine where every hospital seeks to maximize internal revenue may potentially compromise patient care for greater profit. Questions that arise from this are, if results are not seen, how quickly do these referral providers seek external services? In addition, is it even ethical for a surgeon to continue to refer internally despite a therapist’s mediocrity against the Performance Metric? If we were to self-evaluate and rigorously assess ourselves, what value does the allied health provider bring to the patients care and how is that objectified? Does a price tag exist for therapists in this value based payment system? Is cutting cost by reducing referrals to therapists the only value? Do we not offer qualitative value? And if so how is that measured? When I was a young therapist I frequently treated carpal tunnel release surgeries. Now, patients are only referred when complications have arisen. How did it get to that? 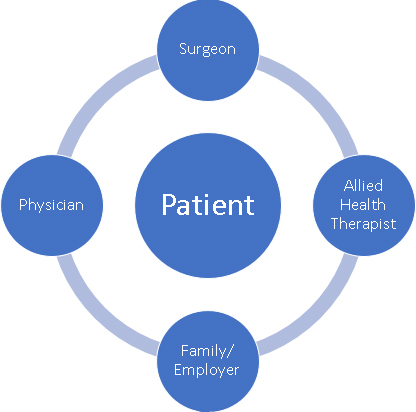 How do surgeons determine which patient to refer to therapy after surgery? Was the change based on job demands assessed? (a stocker at a grocery store vs. a computer engineer) Did they consider the patients return to work requirements and measured it against the patients current functioning after surgery to make that determination, or did they pinpoint what specifically induced the injury, e.g. Ergonomic assessment for the software engineer. Were other systemic conditions considered e.g. : diabetes as a complicating factor? Was patient selection considered, young vs. Old, early onset vs. late onset. Were cost savings the only metric prioritized? Are there quantitative vs. qualitative studies done on total saving? Does the extra therapy on a few patients wash away the saving on the remaining ones? Currently surgeon’s referrals mostly focus on achieving ROM. This is myopic, however, as the lack of focus on all around strength and conditioning may result in secondary injuries/ surgeries. Have studies been performed which measure the frequency of recurring problems? Value based system is not simply defined as cost cutting Instead, it is based on the following pillars: bringing value to the patient, reducing recuperating time, preventing depression, decreasing complications, and preventing lost wages thus enhancing lives. As an allied health professional, it is imperative to add to that value given, we are the eyes and ears for the doctors. Given the length of time therapists spend with patients, strong relationships are formed. Patients often divulge other personal issues, ranging from depression to abuse. Therapists often absorb the role of educators, providing knowledge of diabetes, heart disease etc. in addition to treating patient’s upper extremity condition. We need to be the instrument connecting the dots and aiding in the diagnosis of these patients. Educating patients on how certain conditions for e.g. DM adds to the complications in the UE like frozen shoulder or multiple trigger fingers or carpal tunnel etc. We need to raise our standard to be recognized as the partner in care we provide to these patients and that our views should be heard. We should be better assessors of the injury and communicate freely with the providers while offering conservative management, preventing injuries, reducing medication and thus reducing the overall cost. We need to show the insurance companies our value as outpatient therapists. Employers must recognize that therapist care enables overall cost reductions. Not only do the therapists treat the specific injury, but also educate the patient on exercises to prevent other health related. Patients receiving the best care is more valuable and cost effective than cheap care. In-order to be valuable, therapist’s need to be mindful of their limitations of their services. Progressive conditions require a good home program instead of continuous therapy services. 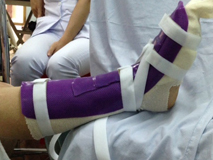 For example, in CMC arthritis a therapist’s responsibility should be based on stage of disease, education of injury, fabricating the custom orthosis, educating in adaptive devices and assist in calming the joint down. Once pain is reduced, the patient needs to be discharged; if pain is not resolved within a month then the individual is most likely in need for either cortisone or surgery. However, a patient’s decision to forgo surgery does not enable them to continue therapy indefinitely. 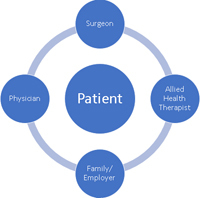 A therapist’s job now becomes one of educator and counselor to educate the patient on prospects of surgery, the process and the outcomes that exists in literature, and consequently providing the cost savings as well. Similar service can be employed to other injuries and conditions, but to do that we must be educated enough to know the injury, have the authority to influence both the patient and the referring providers and assure their mind for a successful outcome or acceptance of the problem. This way we eliminate extras, provide a shared vision, make it an affordable and a much-needed care. Thus, it must be a requirement for therapists to now be able to read X-Rays if not MRI’s, read the results of NCV to know what they are dealing with, and read op reports on patient surgeries to have a better handle on the procedure performed. The industry must not be guided by their income or by just cost savings but to provide the best care for the patient. This will produce cost effectiveness downstream in terms of reducing lost wages, preventing complications, preventing depression and finally preventing secondary problems arising from inadequate results due to minimized care e.g. : lack of flexibility/ strength after a wrist procedure resulting in tendonitis in the elbow. A dialogue between physician, surgeon, allied health professional and the patient is a necessity. We must revise existing methods and partner to propose new methods of care, optimizing on patient value. Cost comparisons between providing minimal therapy for simple procedures and resolving complications via medication without therapy need to be assessed to measure the value that therapy brings. There are numerous studies that show early intervention with therapy is critical to success. At times, patient care is delayed due to the bureaucratic insurance process of authorizations and approvals, thus getting their critical care/splints made later, which affects the outcome of the therapy. How is the role of insurance companies assessed in this value based system? A tier method of payment to surgeons is another deterrent, as some patients end up receiving multiple surgeries at different times thus multiple operating room cost, thereby lowering quality of a patient’s life via longer recovery. Addressing outcome measures, if we are here to add value, why are we measuring outcomes in terms of compensatory strategies? DASH and other outcome measures do not explicitly distinguish between functional abilities and using compensatory and remedial strategies. Training in therapy is not focused on compensation, instead, therapists focus on treatment designed for better care and full operating capacity, thus preventing secondary injuries and preventing future surgeries. Our outcome measures should be more specific and measure the disability this injury caused. After maximal progress is achieved in therapy, then a compensatory /general outcome measure can be offered in the end to see if the person can live with the given injury. To conclude, before a value based system negatively affects therapists, our association must put together a committee to study how therapists are to be measured on their performance, what outcome tools would be best suited for our services and how we add value to the patients’ health care in this Value based payment system. The AAOS Office of Government Relations has established a new Advocacy Fellows Program for residents. We are now accepting applications for 2018. The goal is to encourage the participation of orthopaedic residents in the national health policy arena. The program seeks to foster the development of orthopaedic surgeons interested in health policy and advocacy who are willing to become key members of the AAOS advocacy team. It offers orthopaedic residents the opportunity to gain a greater understanding of the health policy process and contribute to the development of new policies and programs. Dr. Stuart Weinstein, former ChaMarian of the AAOS Political Action Committee, is directing the program. Two fellows will be selected for the calendar year 2018. The deadline for applications is November 15. A full description and application instructions can be found here. For more information contact OGR Senior Manager of Government Relations Julie Williams at jwilliams@aaos.org. AAHS Invites you to follow us on Facebook and Twitter! "Like" us on Facebook to stay up to date with everything happening within our organization. My first medical mission trip took place in May in La Paz, Bolivia, a city that holds a population of 835,000 people, rests at 12,000 ft elevation, and is the capital city in a developing country with a poverty level of 53%. Thanks to the AAHS Hand Surgery Endowment, I was able to join the ReSurge International team on a 2 week trip with team members from all over the United States. After a long plane ride from Miami, we arrived, and enjoyed a day to acclimate to the elevation. We were advised to take Diamox and to drink Coca leaf tea to prevent altitude sickness. None of the team required O2, however two members did have a bad day and required IV fluids and rest. I suffered a mild headache and fatigue with climbing stairs for a few days, if not the entire trip! 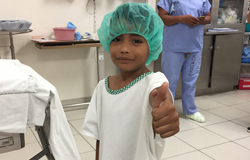 Our host hand surgeon, Dr. Jorge Terrazas, had prescreened patients and arranged for clinic the next day. Patients and families arrived early and were beyond patient, many waiting hours to be seen by the team and be evaluated for possible surgery or conservative management (therapy). 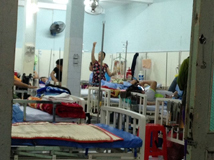 Nearly 80 patients were seen in clinic that first day and each was prioritized as A or B level. Surgeons evaluated patients, created a surgical plan, estimated time for each case, and from there, patients smoothly went through a series of stations. Each was seen by nursing, a pediatrician, an anesthesiologist, and finally a chart was created, photos taken, and each surgical candidate was told that they would receive a phone call the day before their procedure, if they were chosen. Those patients farthest away were seen in the OR the next day and were able to stay overnight. A handful of patients were scheduled for therapy, and some would be told to come back next year, perhaps in some cases, the surgery was more complex than this mission allowed, or an item was absent from the supply list such as Hunter rods. All supplies used on the trip were brought by the team in 15 large containers and it took over five hours to set up the OR and supply room for the next day’s procedures. With 2 hand surgeons, Dr. Nate Morrell and Dr. Subhro Sen, one OR room was used as there was not enough support staff to allow for two rooms to be used simultaneously (one circulating nurse). Local medical residents and staff assisted in the OR and everyone seemed to overcome the language barrier pretty quickly, using the two coordinator/translators often. In therapy, I had three local PTs with me nearly every day, and provided them with some formal but primarily informal training, orthosis fabrication, and sharing of treatment ideas, reviewing protocols, and using our phones to translate whenever we had wifi. Their resources are limited and they very much appreciated the smallest of donations to use for their patients. I was able to obtain many supplies that I purchased or had donated by vendors or my employer and left with the local hand surgeon and therapists. One especially appreciated item was an English to Spanish pocket sized translation manual for hand therapists I found on the ASHT webpage. So to get to the most special part of this trip, our Bolivian patients! I felt honored to treat each of my patients and appreciated by them, even if language was a barrier. I was humbled by the story of a patient I treated 2-3 times/day for the majority of the trip (s/p tenolysis) who lived far away and was able to reside at the hospital to receive therapy. He had a life changing hand injury involving a saw and expressed much emotion as he shared his life’s story of the loss of his father, the loss of a friendship, and the impact of losing the ability to provide for his family as a day laborer. He now has to recover from this most recent surgery and attempt a new career in leather work, one that he has proficiency in and can do primarily with his dominant uninjured hand. I was touched by a mother’s story about not taking her daughter out of the house because the neighbors put the blame on her for her daughter’s congenital hand anomaly. Another mother asked me if I could "blow the scar away" from her daughter’s hand. A woman teared up and gave me a hug when she realized that the night orthoses that I fit for her severe RA were free of charge. I made many orthoses for patients, some whom had previous hand surgery and needed night time orthoses replaced due to growth (peds) or wear and tear. 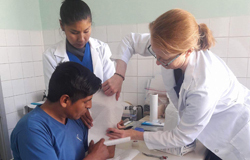 Of the 22 pediatric and 10 adult surgical cases seen over eight OR days, the final clinic day kept myself and the three local therapists very busy. I learned a neat trick that the hand surgeons used; to cast some of the peds cases, bivalve the cast in the OR and coban wrap it, so that there are fewer tears on that 1st postop visit as a cast saw is unnecessary. Therapy was planned following our team visit for many and was provided by the local therapists. Each patient received a home exercise program as applicable, orthosis/sling/cast wear and care (in Spanish), and had any questions answered. Family members were taught how to do dressing changes and plans for a return visit to the local hand surgeon’s office were made. Our team worked so well together, enjoyed some extracurricular activities on our days off, and had most of our meals together. 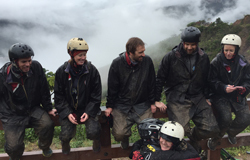 Some of us tried new things such as eating Llama, zip-lining, seeing the world’s largest salt flats, or mountain bike riding on "death road." International travel can be life changing, but providing care for those in need, witnessing the love on a mother’s face after her child received a life-changing hand surgery, or getting someone unable to work, back to employment, it’s hard to put it into words. I’m so grateful to AAHS for this experience. 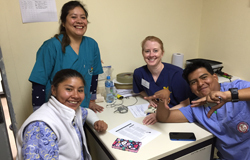 I had the privilege of being part of the Touching Hands Project mission to San Pedro Sula, Honduras in April 2017, with my travel sponsored by a AAHS Volunteer Scholarship from the Hand Surgery Endowment. It was a wonderful experience both on professional and personal levels. We screened 130 patients in one day of clinic, including 78 adults and 52 children. Since this trip repeats every six months, there were 31 patients that were follow-ups from prior visits, which is remarkable given how arduous it is for many patients to get to the clinic. 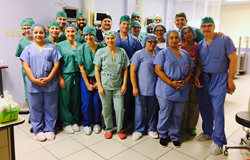 During the following 5 days in the operating room, we performed 57 cases. Our team consisted of three senior hand surgeons (Fraser Leversedge-the Honduras team leader, Scott Kozin-the founder of the Touching Hands Project, and Julie Katarincic), myself, two hand surgery fellows (Steven Koehler and Christopher Hein), an anesthesiologist, two CRNA’s, two nurses, a hand therapist (Kelly Godwin) and an industry partner from Stryker. 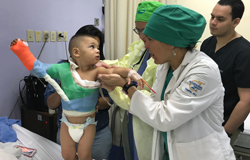 We collaborated with the team from Ruth Paz Pediatric and Burn Hospital, who provided our operative facilities as well as equipment, staff and translators. 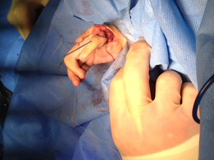 Our cases over the week were varied, from the simple, such as carpal tunnel release or congenital trigger thumb release, to the complex, such as nerve transfers for brachial plexus injuries and pediatric burn reconstructions. What impressed me most about this group was how well it functioned as a team. There were a number of delayed reconstructions of spaghetti wrists from machete injuries (thankfully an uncommon injury in the US! 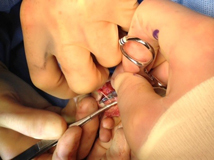 ), and almost all of them needed long sural nerve grafts to be harvested to create cable grafts for ulnar and median nerve reconstructions. Whoever was in between cases or free from the entire group of surgeons would pitch in to harvest these grafts and close the leg. 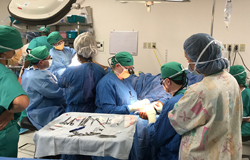 I did not imagine that I would ask surgeons as accomplished as our team members to do the "grunt work," but we all did it for one another and, in the end, it expedited care for our patients. Besides the incredible surgical cases, we got to experience a lot of the good work that our local hosts, Jesus (Chuy) and Gisselle Canahuati, are doing to help the people of San Pedro Sula, including supporting orphanages and schools, and building affordable housing for the many employees at their garment factories. Fraser Leversedge leads this team to San Pedro Sula every six months and does a wonderful job of coordinating with the Canahuati’s and SanMar Corporation to make the trip safe and successful. 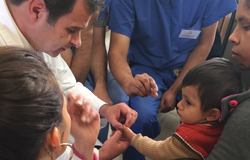 Mission trips like those supported by the Hand Surgery Endowment and Touching Hands Project remind us all why we got into medicine and love hand surgery. I am grateful that the AAHS and ASSH are collaborating to share these wonderful experiences with young hand surgeons and therapists. I strongly encourage everyone to get involved, whether it’s taking part in an international mission, one in the United States, or financially supporting this work. More information can be found at AAHS Endowment and Touching Hands Project. 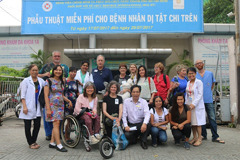 It was a privilege to be the part of this caring, kind and compassionate team to serve at the Orthopedics and Rehabilitation Hospital in Ho Chi Minh City, Vietnam this summer. The team consisted of 2 surgeons, 1 pediatrician, 4 anesthesiologists, 2 OR nurses, 2 PICU nurses, 1 hand therapist, 2 coordinators/translators. We came from CA, OH, NH, MI, ID, OR, CO, Canada and France! Returning to Vietnam was a homecoming for me. I fled there 42 years ago with my family to the US at the end of the Vietnam conflict, 04/30/1975. It was an emotional mission for me. I am so thankful for the opportunity to return there and to serve the underserved community. It was very humbling. The first 3 days of mission, I had the opportunity to work with the local hospital staff and a volunteer occupational therapist, Elaine Lee, from Australia. 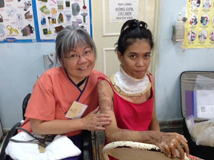 She will be at the Orthopedics and Rehabilitation Hospital in HCMC, Vietnam for 1 year to help set up the therapy department. We worked closely and spent time doing consultations and lecturing/ demonstrating orthoses fabrication, treatment for neurological patients: CVA, SCI, BI and children with CP; all patients have moderate to severe tone in the UE. I joined the surgical team on Thursday and starting to care for post op patients: dressing change, building orthoses, and helping with rounds in the morning, noon and before we leave for the night. Being part of the team, we all pitched in and doing a little of everything. It was awesome. A wonderful highlight was to be in the OR with our surgeons and observed a policization procedure on a young child with aplasia thumb. 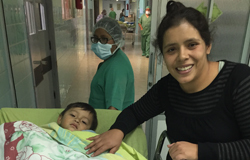 It was a longer procedure since the child has some breathing complication and it took the team of anesthesiologists to get him ready. We saw many post burn injury with major contracture in the neck, elbow, wrist, hands/fingers and feet, a few syndactyly & polydactyly, thumb aplasia. I made a few orthoses that I normally wouldn’t have done here... I made 2 cervical collars and an anterior foot orthosis. One things I learned being part of this mission: one needs to be a bit universal and listen to and able to create things even though that weren’t the norm and ask for feedback! I was happy that it all worked out at the end, especially for the patients that we did surgeries. 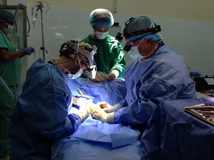 In the two weeks we were there, 8 surgery days, our surgical team was able to complete 43 surgeries. Dr. Bamberger and I lectured to the physicians and staff. 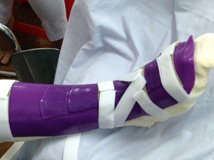 I fabricated over 20 orthoses: fingers, hands, wrists, elbow, cervical collars, and foot orthosis. It was a privilege for our team to be there and to serve. Patients came to us with sadness and heavy hearts... but we saw many smiles and tears on the last day as we said our goodbyes. Patients and their families told us that we gave them hope and their children a chance to have a better live. Many have asked us when we are coming back. The experiences of the two weeks have moved me deeply and I can speak for the team also. This was my first mission; however, many of our team members have been with ReSurge international and other medical missions dated back since the mid 1990's. It is a wonderful feeling knowing we made a difference in people's lives, especially for this underserved community. I would like to take this opportunity to extend my deepest gratitude to the Touching Hands Project for sponsoring this mission. 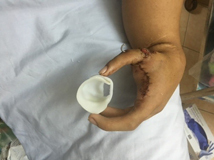 This is the first Hand Surgery and Therapy to Vietnam and I hope this is only the beginning. Thank you to ReSurge International group for organizing, setting up and working diligently in the US and in Vietnam to make this mission possible. Thank you to all benefactors/donors for your financial supports and visions to fund this mission. Last, I would like to thank you each team member on this Vietnam mission. Thank you for your compassion and support to make it possible for me to participate in this mission with all of you. We made an AWESOME team! Hospital room: there is no private rooms and there is no nursing staff attending to patients... family cares for their love ones. Pre-op check in and prep area... there is no privacy. Policization prodecure on one of the patients. Deepening of webspace to allow pinching... he is our special happy little guy! 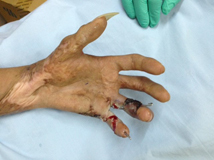 Hand and foot burn post scar and contracture release and skin grafts with pins. This is a 20 y.o female who was doused with gasoline and set on fire. The attacker was never found. She was so fearful and scared. 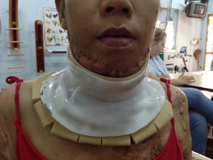 She had minimal cervical ROM and is having difficulty eating and swallowing due to contracture. After the scar release and skin graft, she is pleased and finally smile for us... a small one! This was the first cervical collar I made! Makeshift sling using a towel and Velcro! Scar release and skin graft on anterior of foot... The material was a bit thinner than ideal. Used the small scraps to reinforce for positioning at night since there wasn't enough material available. 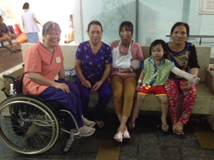 Our team on the first day of clinic at The Orthopedics and Rehabilitation Hospital.